Polish jurist and author; born 1843 at Warsaw; educated at the Royal Gymnasium in that city and at the preparatory college instituted by the marquis Wielopolski, where he devoted himself to the study of jurisprudence and graduated master of law and administration in 1866. He practised law till 1872, and was appointed to the high position of government advocate in the senatorial department of Warsaw (1873). 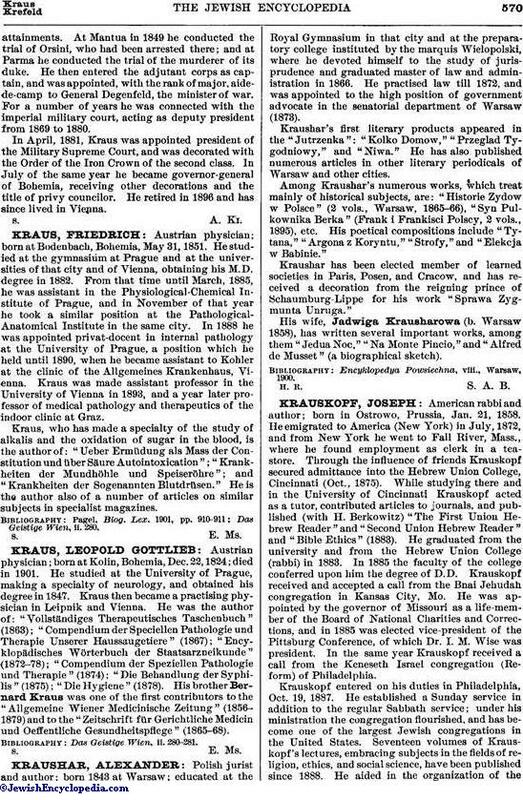 Kraushar's first literary products appeared in the "Jutrzenka": "Kolko Domow," "Przeglad Tygodniowy," and "Niwa." He has also published numerous articles in other literary periodicals of Warsaw and other cities. Among Kraushar's numerous works, which treat mainly of historical subjects, are: "Historie Zydow w Polsce" (2 vols., Warsaw, 1865-66), "Syn Pulkownika Berka" (Frank i Frankisci Polscy, 2 vols., 1895), etc. His poetical compositions include "Tytana," "Argona z Koryntu," "Strofy," and "Elekcja w Babinie." Kraushar has been elected member of learned societies in Paris, Posen, and Cracow, and has received a decoration from the reigning prince of Schaumburg-Lippe for his work "Sprawa Zygmunta Unruga." His wife, Jadwiga Krausharowa (b. Warsaw 1858), has written several important works, among them "Jedua Noc," "Na Monte Pincio," and "Alfred de Musset" (a biographical sketch). Encyklopedya Powsiechna, viii., Warsaw, 1900. H. R. S. A. B.